Hello again! I made this for this week's All That Scraps Challenge to use the colors Aqua, Kraft, and Chocolate! I used this super adorable digi image from C.C. Designs called Pixie Pets Kite Flying Puppy. Soooo CUTE! For my paper I used a combination of October Afternoon Fly A Kite, and Farm Fresh. Ok, that's really it for me today:) My daughter has a friend over for a sleepover, so we need to think of some fun things to do. Have a fantastic weekend! This is just too cute Kerri and perfect dp for those colors!! 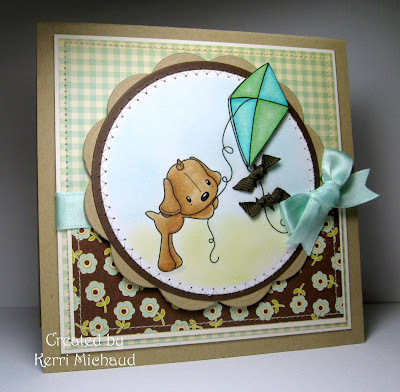 LOVE how you rocked these colors Kerri....I love the added ribbons to the kite..fabulous girl! Enjoy yoru weekend! absolutely fantastic! not only did you color that little puppy with its kit perfecly but I also adore the papers you used and all the littlel details such as the beautiful stitching, the bow and the cut out and poped kite. fab card!!! Look at those little knots you tied on the kite. You are so precise that way.... Love the O/A papers on this....seems to go great with kraft. Have fun with the girls! What a cutie! I really like the papers you chose! You are fabulous, Kerri! What a beautiful card Kerri,I love the image and your papers. Awww, so cute! Sweet, sweet image, love your papers. This is so sweet! I love this card! Awww, I love the papers and the little bows as kite tails :) so adorable. Great coloring too!!! I hope your daughter had a fun sleepover!! ACK.... This is the cutest little puppy ever... Darling darling card. Sooo sweet - what a darling image and the bows on the kite are the perfect touch!